The story goes that the devil was chased all the way from Bowmore’s Round Church into the gates of The Bowmore Distillery, only to escape, so it’s said, in a whisky cask bound for the mainland. Matured in the finest first fill sherry casks, Oloroso and Pedrox Ximenez. 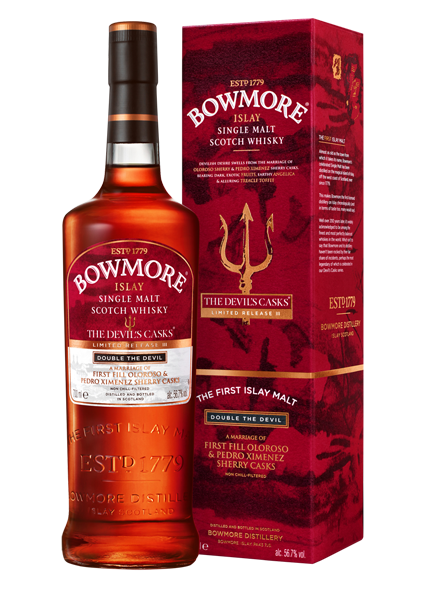 Bowmore’s third, and final, release in the sought after Devil’s Casks series is our most intensely satisfying yet. Marrying spirits matured in both dry Oloroso sherry casks and for the first time sweet Pedro Ximenez sherry casks, which bring an incredible intensity and remarkable richness. This highly sort after edition from the Bowmore Distillery has a smooth, rounded taste of date oil, chocolate fudge and salted treacle, warmed by orange-laced Aruba coffee.